One of our most exciting, break-through products; is our safe, natural alternative to Botox® injections and that product is Nujúvenate. 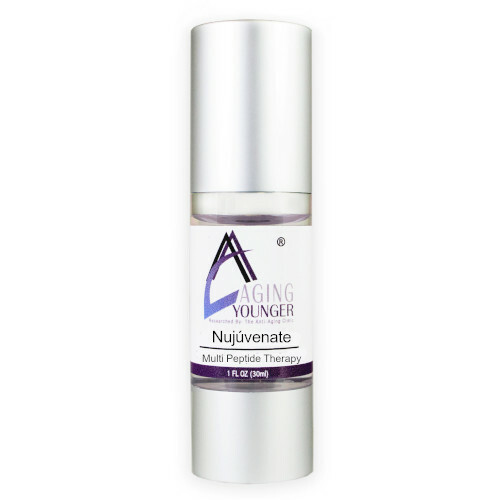 Nujúvenate peptide relaxes the muscles instead of paralyzing them. This product should be used after the toner and before other skincare product applications. Peptides are a chain of amino acids. Peptide fragments are messengers of the natural process of tissue repair. They improve wrinkle depth, wrinkle volume and roughness, to name only a few of the benefits of this Serum. These peptides can significantly modulate muscle contraction thereby destabilizing the cell, so it cannot release the neurotransmitters that makes the muscle contract thus preventing formation of lines and wrinkles. This “Multipeptide” is safer, more inexpensive and a milder alternative to Botulinum Toxin (Botox®); typically targeting the same wrinkle formation in a very different way, by also reducing the depth of wrinkles, seen in the chart below. Tests have shown wrinkles in the line prone areas will be reduced by up to 50% within 28 days. Among the many benefits of anti-aging, “Peptides” are also the latest defense against the signs of aging and sun damage to the skin. However, our sunscreen should always be used as the peptides are not a protection from the sun’s rays, just against the aging signs caused by the rays of the sun. Use twice daily, morning and evening. Apply sparingly to line prone areas. This Serum interacts well with our other skincare products; however, it should be applied directly after cleansing with Alpha Hydroxy Acid before any other products. Apply to clean skin in the morning and evening after cleansing skin with our AHA cleanser.